Within the Solar System we find bodies with a great range of size, as Figure 1.4 shows. The Sun is by far the largest body. Next in size are the four giant planets: Jupiter, Saturn, Uranus, and Neptune. We then come to a group of bodies of intermediate size. Prominent are the Earth, Venus, Mars, and Mercury. These four bodies constitute the terrestrial planets, so called because they are comparable in size and composition, and are neighbours in space. This intermediate-sized group has an arbitrary lower diameter which we shall take to be that of the planet Pluto, the ninth planet. At least one body well beyond Pluto is slightly larger than Pluto - Eris, of which, more later. Seven planetary satellites are larger than Pluto. As their name suggests, planetary satellites are companions of a planet, bound in orbit around it and with a smaller mass. In spite of their size, this binding means that they are classified as planetary bodies, rather than as planets. There are plenty of bodies smaller than Pluto: the remaining satellites, of which one of Uranus's satellites Titania is the largest; a swarm of asteroids, of which Ceres ('series') is easily the largest; a huge number of comets, or bodies that become comets; and a continuous range of even smaller bodies, right down to tiny particles of dust. Figure l.4 Sizes of bodies in the Solar System. 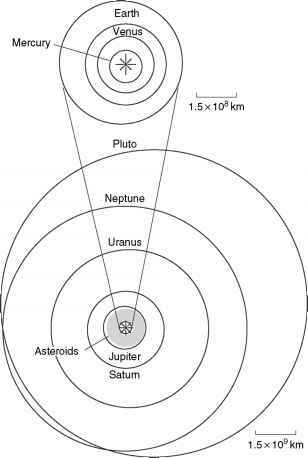 excluding the many satellites of Jupiter and Saturn less that 5 km mean radius, plus a few others of Uranus and Neptune. Table 1.3 covers the 15 largest asteroids. Figure 1.5 shows the orbits of the planets. These orbits are roughly circular, and lie more or less in the same plane. The plane of the Earth's orbit is called the ecliptic plane. The planets move around their orbits at different rates, but in the same direction, anticlockwise as viewed from above the Earth's North Pole - this is called the prograde direction. The asteroids are concentrated in the space between Mars and Jupiter, in the asteroid belt. The distances in Figure 1.5 are huge compared even to the solar radius of 6.96 x 105km. A convenient unit of distance in the Solar System is the average distance of the Earth from the Sun, 1.50 x 108km, which is given a special name, the astronomical unit (AU). Between them, Figures 1.4 and 1.5 provide a map of the Solar System's planetary domain. Figure 1.5 The orbits of the planets as they would appear from a distant viewpoint perpendicular to the plane of the Earth's orbit. The terrestrial planets occupy the inner Solar System (Figure 1.5). They consist largely of rocky materials, with iron-rich cores. Most of the Earth's core is liquid, and this is probably the case for Venus too. Each core is overlain by a mantle of rocky materials (silicates), overlain in turn by a silicate crust. Mercury's surface is heavily cratered by the accumulated effects of impacts from space (Plate 4), indicating little geological resurfacing since the planet was formed. It has a negligible atmosphere. Venus is the Earth's twin in size and mass, and like the Earth it is geologically active, with volcanic features common (Plate 5), but it differs from the Earth in that it has no oceans. The surface of Venus, at a mean temperature of 740 K, is far too hot for liquid water, a consequence of its proximity to the Sun, and its massive, carbon dioxide (CO2) atmosphere. The Earth is further from the Sun and has an atmosphere about 100 times less massive, mainly nitrogen (N2) and oxygen (O2). It is thus cool enough to have oceans, but not so cold that they are frozen (Plate 6). Unlike Mercury and Venus, the Earth has a satellite -the Moon. Figure 1.4 shows that it is a considerable world, larger than Pluto. It is devoid of an appreciable atmosphere and has a heavily cratered surface (Plate 7). Beyond the Earth we come to Mars, smaller than the Earth but larger than Mercury. It has a thin CO2 atmosphere through which its cool surface is readily visible (Plate 8). About half of the surface is heavily cratered. The other half is less cratered, and shows evidence of the corresponding past geological activity. Plate 9 is a view at the surface. Mars has two tiny satellites, Phobos and Deimos (Table 1.2). These orbit very close to the planet, and might be captured asteroids. It is the domain of the asteroids - the asteroid belt - that we cross in the large gulf of space that separates Mars from Jupiter. Asteroids are rocky bodies of which Ceres is by far the largest (Table 1.3), although it is still a good deal smaller than Pluto (Figure 1.4). It is thought that there are about 109 asteroids larger than 1 km, and Plate 10 shows just one with a typically irregular shape at this small size. At a size of 1 metre there is a switch in terminology, with smaller bodies being called meteoroids, and these are even more numerous. Those that fall to Earth constitute the meteorites, which have provided much information about the origin, evolution, and composition of the Solar System. Below about 0.01 mm there is another switch in terminology - smaller particles are called dust. This is widely distributed within and beyond the asteroid belt, and is predominantly submicrometre in size (less that 10-6 m across). The asteroids are sometimes called minor planets. The giant planets are very different from the terrestrial planets, not just in size (Figure 1.4) but also in composition. Whereas the terrestrial planets are dominated by rocky materials, including iron, Jupiter and Saturn are dominated by hydrogen and helium. There are also materials, notably water (H2O). The icy materials tend to concentrate towards the centres, where it is so hot, typically 104K, that the icy materials are liquids not solids. Rocky materials make up only a small fraction of the mass of Jupiter and Saturn, and they also tend to concentrate towards the centres. Uranus and Neptune are less dominated by hydrogen and helium, and the central concentration of icy and rocky materials is more marked. All four giant planets are fluid throughout their interiors. □ What other body in the Solar System is dominated by hydrogen and helium, and is fluid throughout? The Sun is also a fluid body, dominated by hydrogen and helium (Section 1.2). Jupiter is the largest and most massive of the planets. Plate 11 shows the richly structured uppermost layer of cloud, which consists mainly of ammonia (NH3) particles, coloured by traces of a wide variety of substances, and patterned by atmospheric motions. The prominent banding is parallel to the equator. 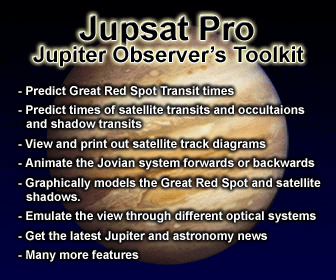 Jupiter has a large and richly varied family of satellites. Figure 1.6 is a plan view, drawn to scale, of the orbits of the four largest by far of Jupiter's satellites - Io, Europa, Ganymede, Callisto. They are called the Galilean satellites, after the Italian astronomer Galileo Galilei (1564-1642) who discovered them in 1610 when he made some of the very first observations of the heavens with the newly invented telescope. They orbit the planet close to its equatorial plane. These remarkable bodies are shown in Plates 12-15. 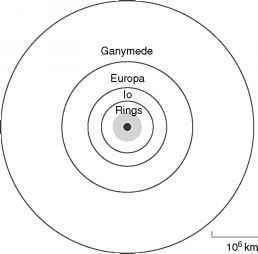 They range in size from Ganymede, which is somewhat larger than Mercury and is the largest of all planetary satellites, to Europa, which is somewhat smaller than the Moon. Io is a rocky body. The other three contain increasing amounts of water (mainly as ice) with increasing distance from Jupiter. Table 1.2 includes all but the smallest satellites of Jupiter. We move on to Saturn, which is somewhat smaller than Jupiter, but is otherwise not so very different (Plate 16). We shall say no more about the planet in this chapter, but turn to its family of satellites, and in particular to its largest satellite Titan, an icy-rocky body larger than Mercury, and second only to Ganymede among the satellites. A remarkable thing about Titan is that it has a massive atmosphere. Indeed, per unit area of surface, it has about 10 times more mass of atmosphere than the Earth. The atmosphere is well over 90% N2 with a few per cent of methane (CH4), but contains so much hydrocarbon cloud and haze that the surface is almost invisible from outside it (Plate 17). Figure 1.6 The orbits of the Galilean satellites of Jupiter. realise that they are rings encircling the planet. Plate 18 shows that each main ring is broken up into many ringlets, to form a structure of exquisite complexity. The other three giant planets also have ring systems, but they are far less substantial. Beyond Saturn we head off across another of the increasingly large gulfs of space that separate the planets as we move out from the Sun. We come to Uranus, a good deal smaller than Saturn, and with a smaller proportion of hydrogen and helium and a large icy-rocky core. In spite of its size it was unknown until 1781 when it was discovered accidentally by the Germano-British astronomer William Herschel (1738-1822) during a systematic survey of the stars. This was the first planet to be discovered in recorded history. It had escaped earlier detection because it is at the very threshold of unaided eye visibility, owing to its great distance from us. Its bands are generally not as strong as those of Jupiter and Saturn (Plate 19). Neptune, like Uranus, was discovered in recorded history, but the circumstances were very different. Whereas Uranus was discovered accidentally, Neptune was discovered as a result of predictions made by two astronomers in order to explain slight departures of Uranus from its expected orbit. The British astronomer John Couch Adams (1819-1892) and the French astronomer Urbain Jean Joseph Le Verrier (1811-1877) independently predicted that the cause was a previously unknown planet orbiting beyond Uranus, and in 1846 Neptune was discovered by the German astronomer Johann Gottfried Galle (1812-1910) close to its predicted positions. Neptune, the last of the giants, is not so very different from Uranus (Plate 20), and so in the spirit of this quick tour we shall say no more here about the planet itself. Uranus and Neptune have many satellites. The largest among them by far, Neptune's satellite Triton, is a rocky-icy body slightly larger than Pluto, and it is the only satellite other than Titan that has a significant atmosphere, though it is fairly tenuous, and allows the icy surface of Triton to be seen (Plate 21). Among Neptune's other satellites, Nereid has a huge and extraordinarily eccentric orbit (Table 1.2). The orbit of Triton is curious in a different way - though it is nearly circular it is retrograde, which is the opposite direction to the prograde orbital motion of the planets and all other large satellites. Beyond Neptune lies Pluto, in an orbit where sunlight is 1600 times weaker than at the Earth. Pluto was discovered in 1930 by the American astronomer Clyde William Tombaugh (19061997) during a systematic search of a band of sky straddling the orbital planes of the known planets. It is a small world (Figure 1.4) and has not yet been visited by a spacecraft. Consequently we know rather little about Pluto and its comparatively large satellite Charon. Pluto is an icy world, with about half of its volume consisting of frozen water and other icy substances, and the remainder consisting of rock. Charon probably has a broadly similar composition. Pluto also has two tiny satellites, Nix and Hydra, of unknown composition. (HST) images have shown to have a radius about 20% larger than Pluto. It is currently (2006) 97 AU from the Sun, and when closest to the Sun lies at a distance of 38 AU. 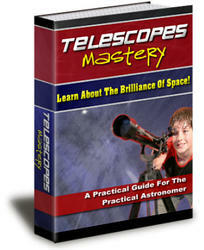 It is estimated that more than 105 EKOs are larger than 100 km across, and lie in orbits out to about 50 AU. There are more EKOs further away, Eris among them, and there are certainly many more that are smaller than 100 km. The Edgeworth-Kuiper belt might blend into the second population of icy-rocky bodies, a swarm of 1012-1013 in a thick spherical shell surrounding the Solar System, extending from about 103 to 105AU. This is the Oort cloud (also called the Opik-Oort cloud). Its outer boundary is at the extremities of the Solar System, where passing stars can exert a gravitational force comparable with that of the Sun. The Oort cloud has not been observed directly, but its existence is inferred from the comets that we see in the inner Solar System. These are a small sample of the Oort cloud and also of the Edgeworth-Kuiper belt, but in orbits that have been greatly modified. Table 1.4 lists some properties of selected comets. That Eris, and several other EKOs, are larger or comparable in size with Pluto, has raised the issue of whether there are several more planets in the Solar System, or whether large EKOs, including Pluto, should not be regarded as planets. At its triennial meeting in Prague in 2006, the International Astronomical Union faced this issue, and passed resolutions defining what, in the Solar System, determines whether a body is a planet. You might be surprised that previously there was no formal definition. The least controversial parts of the definition are that a planet is in its own orbit around the Sun and is large enough for its own gravity to overcome the strength of its materials, which, for a non-rotating, isolated body, would make it spherical. On this basis, Pluto, Eris, and Ceres would be planets. But the IAU added a further criterion, that to be a planet a body has to have cleared material in the neighbourhood of its orbit. This is a tricky concept. The important point is that Pluto, Eris, and Ceres do not meet it, and are therefore to be regarded as dwarf planets. However, the debate is not over. Many astronomers are unhappy with the IAU resolutions, and therefore the definition of what is a planet might well be revised in the near future. Consequently, in this book, Pluto will continue to be regarded as a planet and also as a large EKO. Eris, and other large EKOs, will not, for now, be labelled as (dwarf) planets, and Ceres will continue to be regarded as the largest asteroid. In about 100 words, discuss whether there is any correlation between the size of a planet and its distance from the Sun.